I hate cross country, but I know it’s good for me. I really think it adds to my physical strength and mental toughness as a track runner. In fact, this year I had a few good cross-country races and I actually realised I was way higher up than I thought I would be. I guess that was the start of my improvement. Before I went to Font Romeu, I did a 1000m ‘time trial’. I went through 800m two seconds quicker than I had raced over the distance in 2015. After that, I just really wanted to get out there and race. It was a huge relief to discover all the winter grind had paid off by the time I got to my track season. 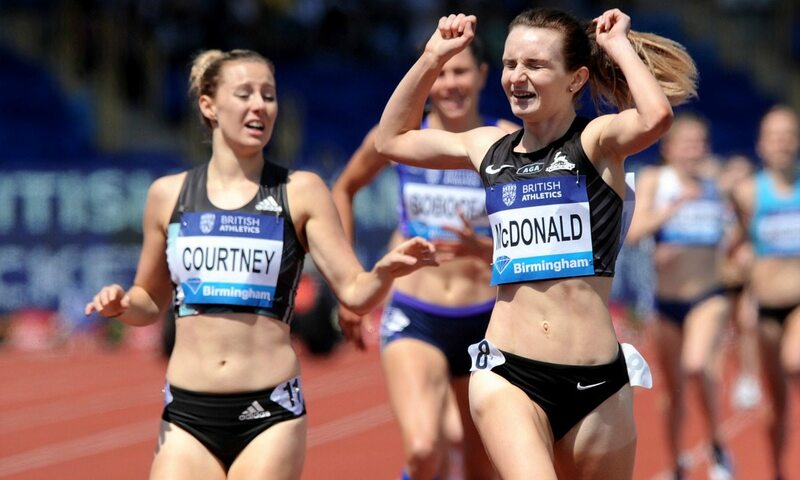 The Birmingham Diamond League was definitely a huge highlight as I ran my PB of 4:07.18 there on home turf. It had been a long time since I had run a PB. I’ve developed a trademark ‘long run to the finish’. It just coincides with the moment in a race where I realise there isn’t too much further to go and I don’t feel quite as awful as I thought I would at that point, so I decide to push on a bit. I used to moan about running a lot, especially if we had a big cross-country session or long reps on the track. This year I tried to take a different attitude and I was a lot more positive. This has helped me to enjoy the process of training a bit more and I have forced it less. I’m still studying medicine at Birmingham University. I decided to split my studies so that I begin again this month. It isn’t easy to mix running and studying medicine, but two of the girls in the Bud Baldaro elite training group, Julia Cooke and Sara Treacy, have done it, so they are great to talk to and get advice from. The medical school have been great and made a lot of adjustments to help me. Sports medicine is the dream at the moment, but I change my mind every other week if something interests me. It can be tough. This year was a harder year in terms of my coursework and placements with a lot of my time on my feet around the wards so I saw running as more of a release and a way of winding down after a day in hospital. I think this reduced the amount of pressure I put on running, which was almost a blessing in disguise. I have bought a house in Harborne, Birmingham. Even though I only have three years left studying medicine, I’m not sure I’ll be leaving the city any time soon. I’m pretty committed to staying here. I couldn’t really ask for a better set up. We are all coached under the watchful eye of Bud Baldaro. Words can’t even begin to describe Bud and how much he’s helped me develop, not only as an athlete but as a person. My least favourite session is definitely split 800s. This might be something like blocks of 400m at 800m race pace with 30 seconds rest, then 400m at 800m race pace. It’s the only ever session which has made me close to throwing up. My favourite session is blocks of 300m at varying pace. I like to do it as a confidence boost approaching big races. Life in Font Romeu revolves around sleeping, eating and running. I flew out there as soon as my exams were finished, so it was a bit of a shock to the system to have no work or plans for the day, but I soon settled into the routine of doing nothing. It was a good experience, but it was very hilly and I’d hoped for a little less snow and a bit more sun. I used to be a figure skater. I only started running when I was in the sixth form and an injury meant I couldn’t skate any more. I usually spend most of my runs trying to find the perfect song. Just before I went into the call room at the British Indoor Championships, I dropped my little iPod shuffle down the toilet, panicked and left it there. After my heat, I had to go shopping to buy a new one before the final the next day, so I could have it for my warm-up. I grew up in the North East, but I’m not as hard and tough as some Geordies. It has been known for me to run on the treadmill if I don’t want to get my hair wet. I’m a bit of a fair weather athlete now. I used to have a lucky pair of race socks. I didn’t wash them, but they eventually grew feet and walked into the washing machine. Now I seem to do everything in my long compression socks (even sleep). I think everyone has race day ‘rituals’, and I’m no different. I don’t want to give too much of my weirdness away.